Frailea castanea Backbg. This is a marvelous plant!—beautiful, little chestnut brown body; tiny, harmless, reddish black spines; large, pure yellow flowers! (There is one slight catch; the flowers of fraileas rarely open . . . but there's a consolation too: when they don't open, they almost invariably set seed.) The plants grow well and fast from seed, and often flower when they are scarcely a year old! It is incomprehensible that a plant this desireable and so easy to grow and propagate is so rarely seen in collections. 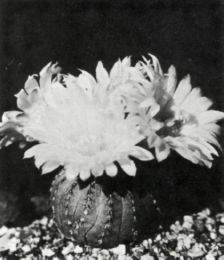 The plant has been known since 1937 as Frailea asterioides Werd., but Backeberg pointed out that he had already described the species as F. castanea in 1935. It comes from southern Brazil, near Alegrete, Rio Grande do Sul, and from neigh­boring northern Uruguay. Backeberg claims that they have a short lifespan in cultivation, and recommends grafting. We have had success both with grafted plants and plants on their own roots.